STOCKHOLM — Mike Hoffman scored two power-play goals and Erik Karlsson had two assists for the Ottawa Senators in a 4-3 win against the Colorado Avalanche in the second game of the 2017 SAP NHL Global Series at Ericsson Globe on Saturday. 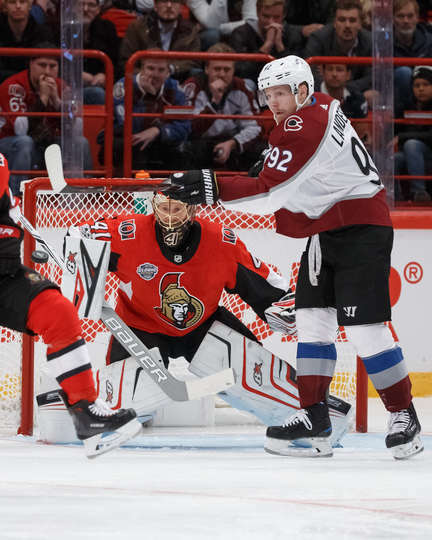 The Senators, who won 4-3 in overtime Friday, swept the series and outshot the Avalanche 72-37 in the two games, including 40-18 Saturday. Hoffman’s power-play goal at 13:23 of the third period gave Ottawa a 4-3 lead. Stockholm native Johnny Oduya and Mark Stone scored for the Senators. Stone, who scored two goals Friday, including the overtime winner, has nine goals in the past nine games. Craig Anderson made eight saves after relieving Mike Condon (seven saves) at 10:36 of the second period for the Senators (8-3-5). Blake Comeau, Alexander Kerfoot and Sven Andrighetto scored for the Avalanche (8-7-1). Jonathan Bernier made 36 saves. Oduya tied it 3-3 with a one-timer off a cross-ice, off-the-boards pass from Nate Thompson at 7:01 of the third period. After Kerfoot was called for hooking in the offensive zone at 8:53 and Colorado killed the penalty, Mark Barberio was called for tripping at 13:13, leading to Hofmann’s power-play goal. Matt Duchene played the puck down low to Stone, whose pass to Hoffman in the slot was knocked down by Avalanche defenseman Chris Bigras. He inadvertently knocked the puck to Hoffman, whose shot from the slot beat Bernier to the glove side. Colorado had a chance to do the same when Jean-Gabriel Pageau was called for high-sticking at 15:04 of the third period, but the Senators killed the penalty. “Saved the game,” Ottawa coach Guy Boucher said. Colorado and Ottawa combined for four goals in the second period, including three in a span of 2:02. Colorado took a 2-1 lead on Kerfoot’s power-play goal at 8:34, but Stone tied it 42 seconds later off a pass from Karlsson, who pinched down the right-wing wall. Andrighetto gave the Avalanche a 2-1 lead at 10:36, the final shot Condon faced. Hoffman tied it 1-1 12 seconds into the second period when he dumped the puck in from the left point and it bounced on its edge, curved to the right and got past Bernier. “I think that would have went in against any goalie,” Hoffman said. Colorado took a 1-0 lead on Comeau’s goal on a shorthanded breakaway at 13:13 of the first period. Hoffman’s goal at 13:23 of the third period. Anderson’s save on Landeskog during Colorado’s power play at 16:09 of the third. Karlsson’s pinch to create Stone’s goal at 9:16 of the second period. Senators forward Zack Smith will miss three weeks because of a dislocated thumb, an injury he sustained in the game Friday. … Senators forward Matt Duchene had eight shots on goal playing 16:19 in his second game for Ottawa after being traded by Colorado. Avalanche defenseman Samuel Girard, part of that three-team trade from the Nashville Predators, had two shots in 22:39. … Kerfoot has four goals in a three-game streak. … Karlsson has 11 points (one goal, 10 assists) during his seven-game point streak.